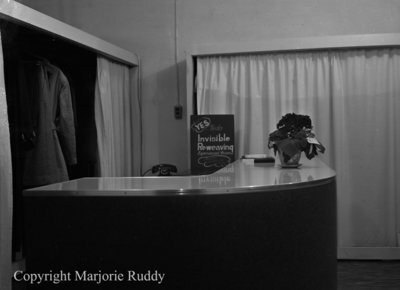 A black and white large format negative of the front desk inside of K & M Cleaners located at 112 Colborne Street West, Whitby, Ontario. This negative has started to degrade. K & M Cleaners, February 17, 1952, Marjorie Ruddy. Whitby Archives, A2013_040_472.